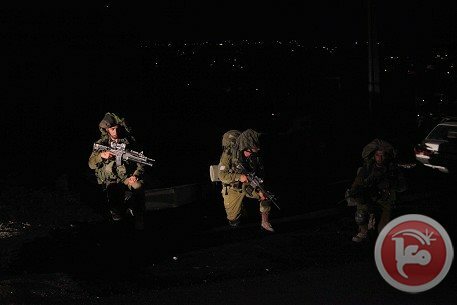 Israeli soldiers invaded, on Thursday at night, several Palestinian communities in the southern West Bank district of Hebron, broke into and ransacked dozens of homes, and clashed with local youths, causing several injuries. Several children were detained for hours. Medical sources in Surif town stated that three Palestinians have been shot with rubber-coated metal bullets, while several residents suffered the effects of tear gas inhalation. The four have been identified as Saleh Abu Fara, Ala’ Abu Saleh, Hammad Jamal Hmeidat, and Sabri Abu Saleh. In addition, an entire family suffered the effects of tear gas inhalation after Israeli soldiers fired a gas bomb into their home. 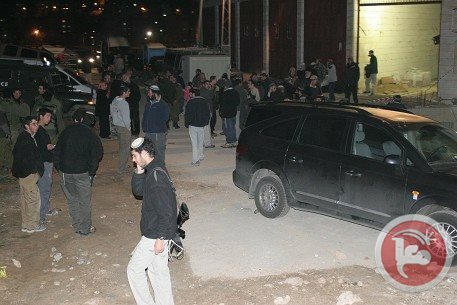 Dozens of soldiers also invaded Beit Kahel nearby town, detonated the main door of the Islamic Charitable Society, before loading its files, computers and furniture into trucks, and confiscated them. The invasion led to clashes with local youths who threw stones at the invading soldiers, while the army fired gas bombs, causing several residents to suffer the effects of tear gas inhalation. 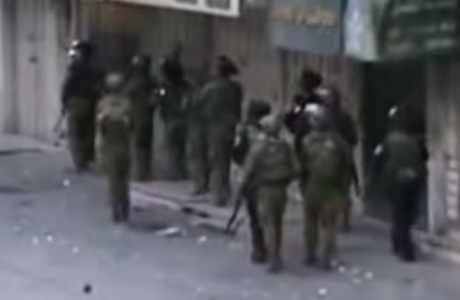 Furthermore, dozens of soldiers invaded the al-Arroub refugee camp after disconnecting its power supply, stormed and violently searched dozens of homes. In Hebron city, the soldiers kidnapped Abed Nimir az-Zeer, in the al-Harya Valley area, and also stormed, and searched, dozens of homes. Eyewitnesses said dozens of soldiers invaded the Jaber neighborhood, in the Old City of Hebron, and detained three children for several hours. The children, Safwan Basha al-Jaber, 10, Montaser Abdul-Wahab ar-Razem, 8, and his brother, Mo’taz, 10, were released the Palestinian side of the District Coordination Office (DCO) in the city, intervened and secured their release. Meanwhile, residents Abdul-Hamid at-Teety, from the Old City, resident Mohammad Zamel Abu Mariyya, 45, from Beit Ummar, town, Abed Nimir az-Zeer, 32, from Doura town, and Mohammad Ahmad al-Heeh, from Surif, have all been kidnapped at a roadblock near Gush Etzion settlement. In related news, a number of fanatic Israeli settlers stormed the home of Yousef Ghneimat, in Surif town, and issue that led to clashes between local residents and the settlers. 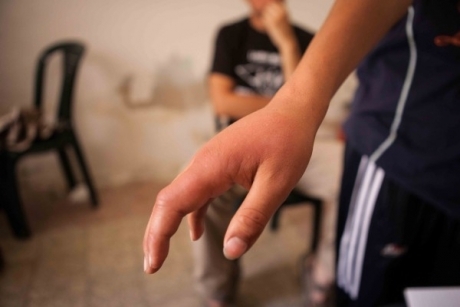 Israeli soldiers then invaded the area, and fired rubber-coated metal bullets at the Palestinians, causing several injuries. Israeli forces detained 13 Palestinians and closed down two charities in the West Bank overnight Wednesday as part of a manhunt to find two men accused of kidnapping and killing three Israeli youths. In Beit Kahlil, Israeli forces used explosives to blow open the main door of an Islamic charity and emptied all of the contents onto a military truck. Palestinian youths responded by hurling stones at Israeli forces, who fired rubber-coated bullets and tear gas canisters at locals. In Surif, northwest of Hebron, a group of settlers surrounded a Palestinian home, leading to clashes with locals. Israeli forces arrived at the scene and fired rubber-coated bullets at local Palestinians, injuring Salih Jibril Abu Fara, Alaa Sabri Abu Salih and Hammad Jamal Hmeidat. Israeli forces raided el-Arrub refugee camp in Hebron and ransacked several homes, while in Hebron Abed Nimir al-Zeir was detained after soldiers ransacked his house. An Israeli army spokesman said 13 Palestinians were detained overnight and two charities were closed down as part of "ongoing operations." Israel has detained hundreds of Palestinians, killed 6, and injured dozens as part of a large-scale detention campaign following the disappearance of three Israeli youths on June 12. Their bodies were found in a shallow grave near Halhul on Monday. Last week, the Israeli military officially identified Marwan al-Qawasmeh, 29, and Ammar Abu Eisha, 33, as the two main suspects in the kidnapping of the youths. The West Bank campaign has systematically targeted Hamas members and institutions, despite the group having categorically denied involvement in the kidnapping. Dozens of Israeli settlers on Wednesday attacked Palestinian cars near the Jerusalem village of Jaba, locals said. Witnesses told Ma'an that over 60 settlers attacked Palestinian cars with rocks, causing damage to several vehicles. Israeli forces were at the scene but did nothing to prevent the attacks, locals added. Overnight Tuesday, settlers set fire to an animal farm in the northern West Bank. 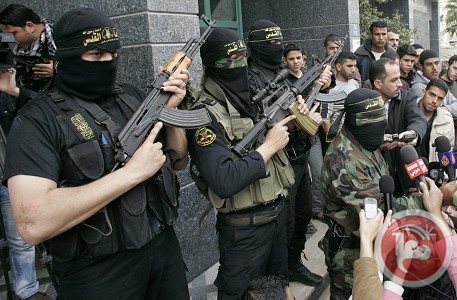 The Islamic Jihad movement said Wednesday that settlers were a “legitimate target” for Palestinians and the resistance. In a statement, Islamic Jihad held Israeli authorities and the army responsible for its continuous attacks on Palestinians, their lands and religious sites. 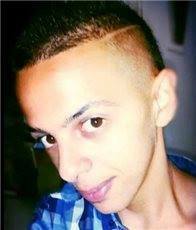 The statement condemned the “crime” of kidnapping and killing of Muhammad Hussein Abu Khdeir. The movement said this “crime” was a continuation of a series of crimes by the Israeli army and settlers which also killed Youssef Abu Zagha from Jenin refugee camp on Tuesday. A human rights group based in Hebron in the southern West Bank published video footage Wednesday featuring Israeli settlers and soldiers assaulting Palestinian residents in the Tel Rumeida neighborhood in the center of Hebron. The footage, taken Tuesday night by “Human Rights Defenders”, shows activist Tahir Dweik being attacked while he walks near an Israeli military checkpoint in Tel Rumeida. As Dweik comes close to the Israeli troops, they force him to stand facing the wall and then inspect him after taking his ID card. The soldiers then cuff his hands before one of them pushes him, causing him to fall to the ground. The video also shows a female settler attacking family members of another activist in the same group, Imad Abu Shamsiyya. The settler is seen entering the property of the Abu Shamsiyya home and taking photos. Abu Shamsiyya’s wife starts to shout and call for help while taking photos of the settler. Israeli soldiers are then seen forcing the Abu Shamsiyya family to go inside and lock their doors behind them while the female settler remains in their yard. A child settler hurled stones at Abu Shamsiyya’s wife,breaking her mobile phone, but that attack was not caught on the video, according to the group. 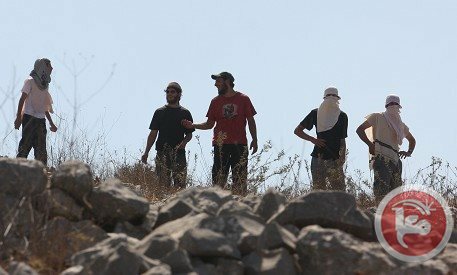 Israeli settlers hurled stones at Palestinian vehicles as they drove on a bypass road near the village of Husan west of Bethlehem in the southern West Bank, locals told Ma’an. They reported that a number of vehicles were hit and sustained damage. Israeli settlers early Wednesday set fire to an animal farm in the northern West Bank on Wednesday, a Palestinian official said. Ghassan Daghlas, a Palestinian official who monitors settler activity in the northern West Bank, told Ma'an that a group of settlers set fire to a sheep farm in Aqraba village south of Nablus at 3 a.m.
Palestinians managed to round up the sheep, but the steel structure surrounding the farm was destroyed by the fire, Daghlas said. 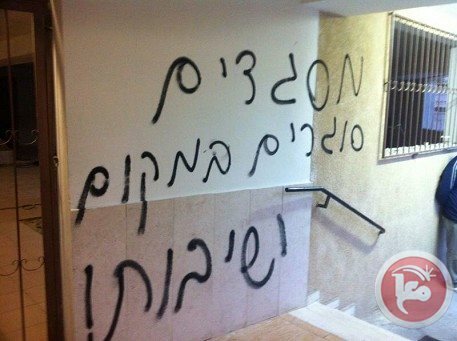 Settlers spray-painted the words "blood vengeance" and "price tag" in Hebrew on the outer walls of the farm, he added. The farm belongs to Fadi Basim Bani Jabir. Daghlas said the settlers came from the illegal settlement of Itamar south of Nablus. Later, in the Bethlehem district, Israeli settlers hurled stones at Palestinian vehicles as they drove on a road near the village of Husan, locals said. A number of vehicles were hit and sustained damages, they said. The attacks come in the wake of the burial of three Israeli teens who were found dead in the Hebron district on Monday. Hours after they were buried on Tuesday, around hundreds of Israelis marched through Jerusalem, stopping cars and shouting "Death to Arabs," police and witnesses said. A Palestinian teenager from occupied East Jerusalem was kidnapped and killed early Wednesday in a suspected act of revenge for the killing of three Israeli youths, Israeli army radio reported. Two settlers stepped out of a Hyundai and forcibly pulled the boy inside before the driver sped away, added the sources. The Jerusalemite teenager Mohamed Abu Khudeir, 17, was found dead at dawn Wednesday after being kidnapped, tortured, and burned to death by Israeli settlers in Shuafat town southern occupied Jerusalem. Local sources revealed that Abu Khudeir was kidnapped by three Israeli settlers while on his way to Shuafat mosque to perform dawn prayers. Israeli police found the body of an Arab teenager in the Jerusalem area on Wednesday after being tortured and burned, Israeli media sources said. 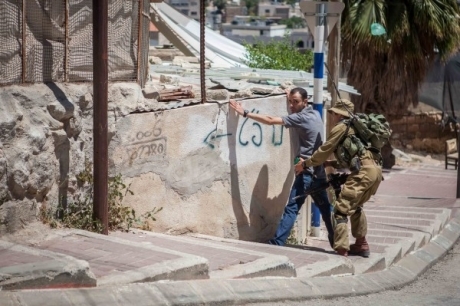 Israeli police have been notified that an Arab teenager was forced into a vehicle in Beit Hanina neighborhood northern occupied Jerusalem, the sources said, adding that they were investigating a possible connection to the reported kidnapping of a Palestinian youth earlier in the day. According to Yediot Ahronot Hebrew newspaper, the teen Abu Khudeir was found dead after being burned by Israeli settlers near Givat Shaul settlement. The possibility the Palestinian teen was kidnapped and killed as part of revenge attack after the killing of three Israeli settlers in al-Khalil was being investigated, the newspaper said. Following the settlers' crime, violent clashes erupted between Israeli forces and Jerusalemite youths in Shuafat town. Israeli soldiers heavily fired tear gas bombs and rubber bullets during the clashes, and closed the town’s entrances. Several Palestinians including journalists were injured, the PIC correspondent reported. Angry Palestinian youths, in turn, attacked the Israeli train station in the town, the PIC reporter added. Other settlers arrived and began to harass the Palestinian children and tried to steal their football. The settlers also began to push some of the Palestinians. One settler tried to force entry into a Palestinian shop whilst shouting, “I’m going to butcher you”. The Hebron district is a site of frequent aggression, by Israeli soldiers and settlers, towards Palestinian residents and their property.